The Westland Widgeon was a light aircraft of the 1920s. A single-engine parasol monoplane, the Widgeon was built in small numbers before Westland abandoned production in 1930. 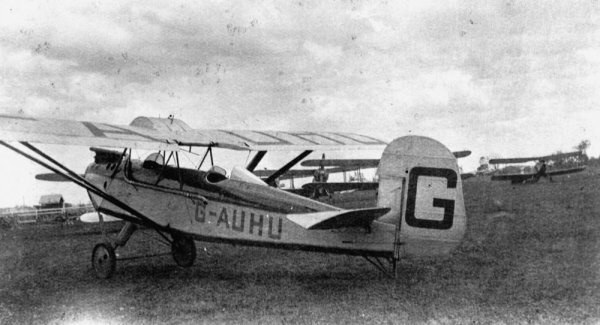 In 1924, the British Air Ministry, eager to encourage the development of cheap civil aircraft suitable for use by private owners and flying clubs, sponsored a competition for a two-seat ultra light aircraft, which had to be powered by an engine of 1100 cc displacement or less and capable of carrying a load of at least 340 lb (155 kg). To meet this requirement, Westland Aircraft produced two designs, the Woodpigeon biplane, and the Widgeon parasol monoplane. Unable to decide which design would be superior, Westland decided to build both types. The Widgeon proved expensive compared to its competitors and a total of only 26 of all types, including the prototype, were built and sold before production was stopped in 1930 in order to allow Westland to concentrate on the Wapiti general-purpose military aircraft and the Wessex airliner. Widgeon I - Powered by one 35 hp Blackburne Thrush radial engine. One built. Widgeon II - Rebuild of Widgeon I with 60 hp Armstrong Siddeley Genet radial. Widgeon III - Redesign for production. Powered by ADC Cirrus II or III inline engine, Genet II radial, ABC Hornet or de Havilland Gipsy. 18 built. Widgeon IIIA - Variant of Widgeon III with metal fuselage and new undercarriage. Powered by Cirrus or Gipsy engine. Seven built. 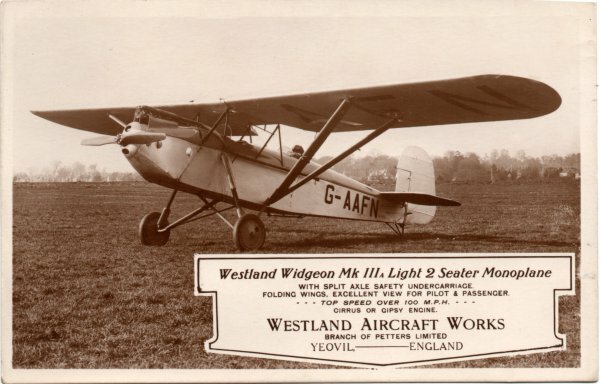 A 1920's advertising postcard of the Westland Widgeon. An contemporary photograph of a Widgeon. A seaplane version of the Westland Widgeon. Westland Widgeons - Marks II and III.